To chat about your video requirements, please get in touch via the form below give us a ring or drop us an e-mail. Winner of the 'Best Wedding Videographer' category in London and the SE at The Wedding Industry Awards 2015. 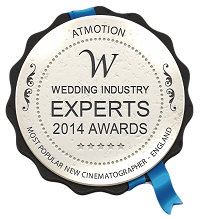 Winner of 'Most Popular New Cinematographer in England' at The Wedding Industry Experts Awards 2014. Atmotion Ltd, All Rights Reserved.